Last week was home to one of the worst days for stocks of the entire year as tensions between the United States and North Korea escalated to new levels. Although the tensions resulted from only a verbal conflict, it was enough to send markets into a tailspin. However, earlier in the week, both the S&P 500 and Dow Jones Industrial Average made new all-time highs on Tuesday. S&P 500 futures traded as high as $2,488.5 while Dow Jones futures rallied to $22,132 during Tuesday’s session. But the rally didn’t hold. Gains were rapidly reversed when President Trump explicitly stated that the United States would respond with “fire and fury” to any additional missile threats from North Korea. North Korea has been testing and threatening missile strikes for months, and it seems to have finally reached a boiling point. Markets around the world immediately declined after the “fire and fury” comments but managed to rebound slightly on Wednesday as the fear of a North Korean missile strike seemed to lessen. However, everything changed when North Korea surprised the world when it released a plan on Thursday to send several missiles targeted directly at the small US territory of Guam by mid August. As the reality of a possible nuclear war between North Korea and the United States sunk in, investors dumped stocks and flocked to the usual safe haven assets of gold and bonds. Gold futures for September delivery soared more than $14 per ounce to trade around $1,292 on Thursday with additional gains on Friday. The yellow metal traded just shy of the key psychological level of $1,300 during Friday’s trading session and flirted with making a new yearly high. The CBOE VIX Index, also known as Wall Street’s “fear gauge” soared to it’s highest level since election day after the North Korean news. At it’s peak on Thursday, the VIX was up 44% and printed as high as 17.28. Nevertheless, volatility declined on Friday as investors had more time to digest the news. 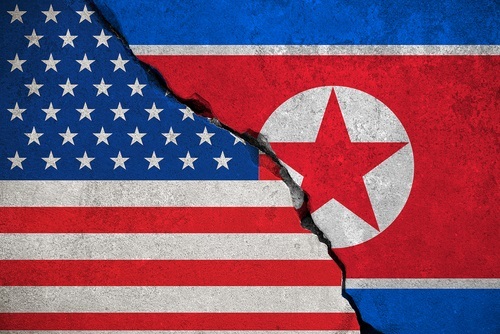 “From a geopolitical perspective, we understand why the escalation in tensions will have shaken some of the complacency out of investors,” said Eric Wiegand, senior portfolio manager at U.S. Bank Private Client Wealth Management. However, the possibility of a global conflict doesn’t necessarily change the valuations of companies. “While the risks remain elevated from a geopolitical perspective, valuations are not necessarily excessive, though full. But we're in a low inflationary environment, which can help valuations remain elevated for longer than they would otherwise,” Mr. Wiegand went on to say. The low inflationary environment and strong fundamentals likely prevented further panic selling on Friday. Nevertheless, an all-out nuclear war between the US and North Korea, if it were to occur, would likely make Thursday’s trading action look like a warm-up. Despite Friday’s rebound, stocks still closed largely in the red for the week while gold closed with an impressive weekly gain of over 2%. Last week is a quintessential example of why it pays to own precious metals as a form of diversification in an investment portfolio as well a hedge against extreme times of uncertainty and potential global conflict. Since 1975, Blanchard has successfully helped 450,000+ clients invest prudently in precious metals and rare coins. Our team of experts are always here to help you make the right investment decisions and capitalize on opportunities in the precious metals market.